The parliament of Haryana state in northern India has banned the slaughter of cows and sale of beef in a unanimous vote. The law imposes both a fine and a rigorous imprisonment term ranging from three years to 10 years for killing the animal. “The cow is our mother and we need to protect her at any cost,” Om Prakas Dhankar, Haryana agriculture and animal husbandry minister, said, as cited by Pakistani newspaper, The Tribune. 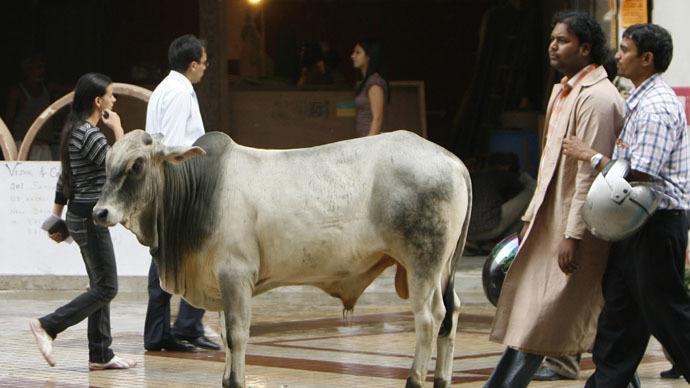 Cows are considered sacred in Hinduism which is practiced by the majority of the population in the region. The ruling Hindu nationalist Bharatiya Janata Party (BJP) pledged to work to protect cows in the party’s election manifesto. The recently-passed law prohibits the slaughter of cows and intends to promote the conservation and development of indigenous breeds of cows and establish special institutions and sanctuaries to take care of infirm, injured, stray and uneconomic cows. According to the law, a person found guilty of cow slaughter can be sentenced up to 10 years in jail, with an additional fine of up to 100,000 rupees (over $1,500). Imprisonment of up to one year can also occur if the fine is not paid. The export of cows for the purpose of slaughter will be punished with an imprisonment term of no less than three years which may be extended up to seven years with fines ranging from 30,000 to 70,000 rupees ($470-1,100). This includes exporting cattle to the states where slaughter is permitted. The law also completely bans the sale of any kind of beef and the offense will be punished with imprisonment of no less than three years and up to five years with fine of up to 50,000 rupees (about $800). The vehicles used for any of these violations will be confiscated. “No person shall sell or offer for sale or cause to be sold beef or beef products..," the law says. According to the law both cow slaughter and beef sales are non-bailable crimes and the burden of proving innocence would be on the accused, Times of India reports. The government stated special laboratories would be established for the differentiation of beef from the meat of other animals, as well as milk analysis. The adoption of the law follows the example of the western Maharashtra state which passed a law at the beginning of March which imposes a five year prison term for slaughtering a cow. “India is a diverse country and in a diverse country; people have different culinary habits,” Congress leader Manish Tewari said on Tuesday. In 2013 and 2014, India was the second world exporter of beef with composing almost 20 percent of world exports, according to the Foreign Agricultural Service of the US Department of Agriculture. In 2014, India also had the largest cattle inventory in the world with over 301 million animals.